DC weather may have been putting a damper on your days but here at DC UrbanGreens we have had nothing but rays of encouragement to brightened the mood! When the weather has you down walking into hoop house full of vibrant new life will surely liven your mood! The field staff at DC UrbanGreens has been taking advantage of the cooler weather (despite the odd heat wave of a stifling 86 degrees day on Friday) to prepare our garden beds for Fall planting! We are now in full swing with our Autumn crops. Below is Suliman, our Market Director, preparing a bed for Romaine Lettuce transplants. He is normally so busy selling and networking with community members that he rarely gets time in the dirt. We gave him the treat last week of planting a few of our newest beds. Way to go Suliman! A jack of all trades! 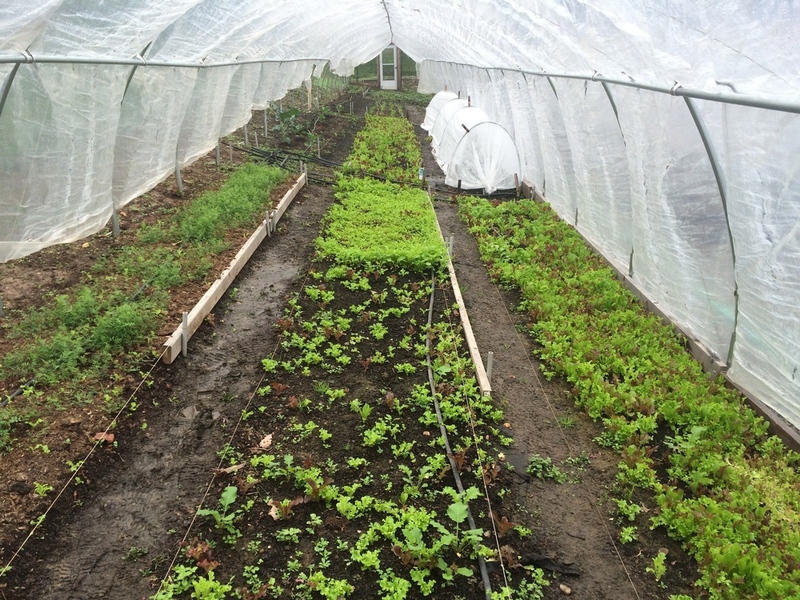 In this hoop house alone we have lettuce mix, mustard greens, spinach, collards, carrots, and strawberries. At our Fort Dupont location we have a total of three houses identical in size and varying in produce. Just think, our newest site (Fort Stanton) will have double the amount of hoop houses which means double the amount of food being provided to food desert neighborhoods. Here at DC UrbanGreens, we stand in awe of how land is becoming available to further our mission. 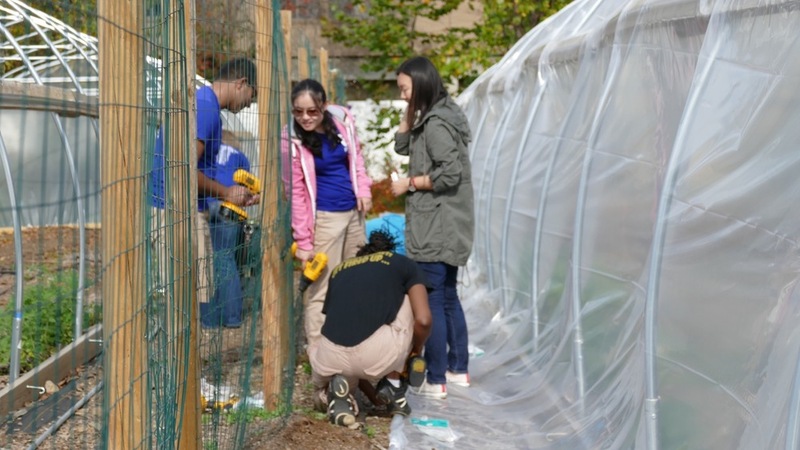 Marvin Gaye Greening Center received a face lift this past week! With this site being our newest (we broke ground in April) our first goal was to start planting food. 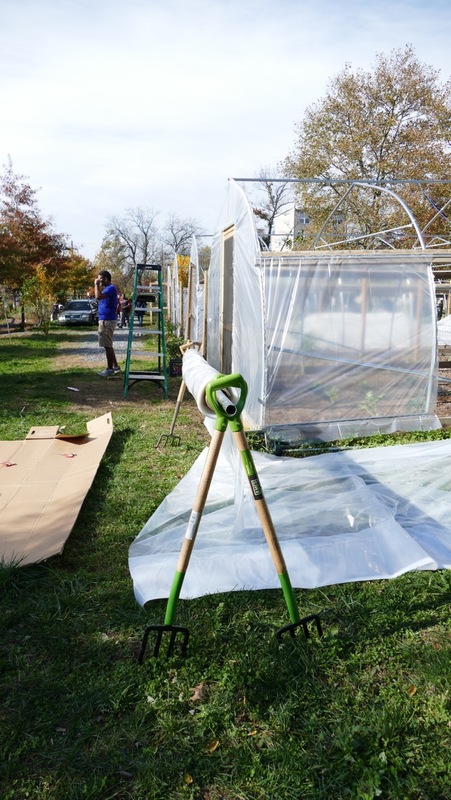 Now that cold temperatures are right around the corner it became necessary to install plastic on the hoop houses. With the help from EdOps they were able to almost complete the whole site. We loved their high energy, enthusiasm, and incredible teamwork; DC UrbanGreens benefited greatly. Thank you EdOps for your bright spirits and hard work!! We are growing more than food but relationships too! Just in the past month DC UrbanGreens has been able to expand our food distribution to the Woodbridge neighborhood in NE D.C by way of Good Food Markets. Philip came to have a tour of one of our farms and it was an immediate connection. The vision of Good Food Markets is to provide the community with fresh, quality produce, essential grocery items, and healthy, delicious prepared grab-and-go meals. Our thought exactly :) So, what does this mean for DC UrbanGreens? We have started small with sample produce for their staff as well as dedicating a few of the garden beds solely for Good Food Markets. We are thrilled with this new partnership and the new connection to increase local, fresh food to more areas in need. First on the list, parsley and spinach! YUM!